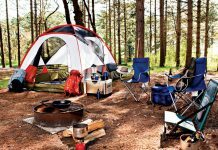 Home Camping Gear Top 10 Camping Coolers or Camping Fridge for Your Camping Trip! 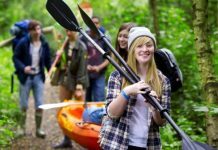 Top 10 Camping Coolers or Camping Fridge for Your Camping Trip! 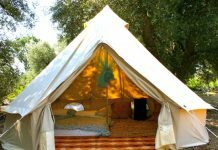 Different camping needs require different types of camping coolers or camping fridge. You can find one that suits your need. 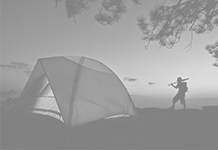 Camping coolers are available in different types like the back pack coolers for backpacking trips, huge camping fridge to keep your perishables safe when camping, etc. Because they are available in a large range of sizes, colors and prices, you will find one that is just perfect for you. This handy stainless steel camping cooler will hold 85 cans. It has a steel latch that seals securely and stainless steel rubber grip handles, making it easy to carry. The screws and hinges are rust resistant protecting it against breakage and rust. These types of camping coolers are easy to clean. The base, liner and lid can all be cleaned to maintain hygiene. It also has a channel drain so that you don’t have to tilt it in order to drain it. The channel is rust proof to avoid damages. Its dimensions are 24.25″ x 16.75″ x 16.75″ and comes with a 6 year limited warranty. It is available online at coleman.com for $219.99. 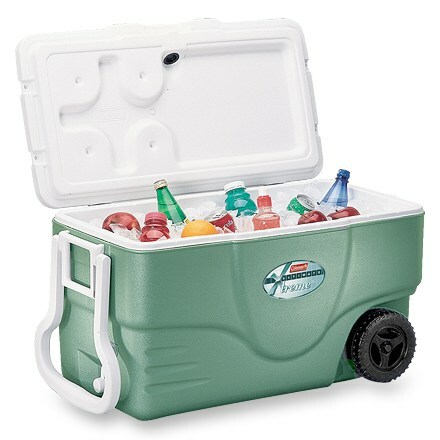 This is one of the practical soft sided camping coolers that you can carry for your next backpacking trip. It has two completely insulated compartments to keep the perishable items safe. The waterproof linings are removable and can be wiped clean. The materials used are 100%PVC free. It is comfortable to carry as it has padded shoulder straps that can be adjusted, a sternum strap and a nylon waist belt that can be removed when not needed. 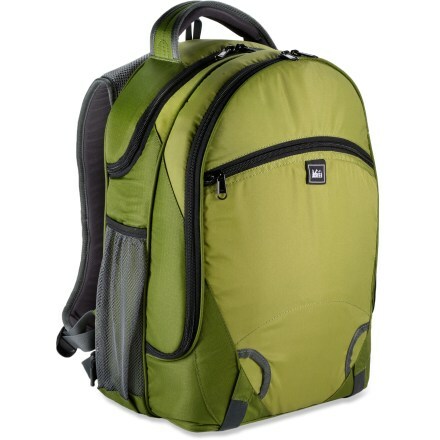 The bag has side pockets to hold bottles and it is padded to protect your stuff. Available in Midnight/Aviation blue and Shamrock/Elm green, it can be yours for $44.50 only. 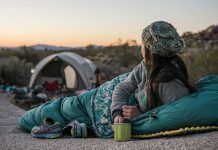 Grab it from rei.com. Replace your picnic basket with this representative of the handy camping coolers from REI. Fully insulated it keeps your heat sensible food safe and cool for many hours. The cooler is well supported with a EVA molded foam bottom, which keeps it protected. The waterproof liners can be wiped clean and are leak proof. They are also PVC free. The cooler has exterior pockets to hold the napkins and other useful camping stuff . The picnic cooler has compression straps to secure the much needed picnic blanket. 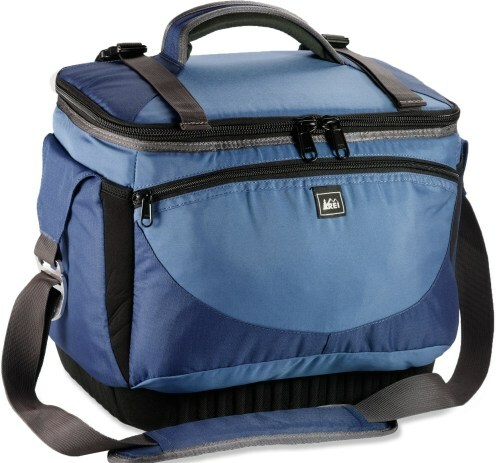 This complete picnic cooler also has a padded carry handle along with shoulder straps for easy carrying. When not in use it can be compressed to be stored easily. 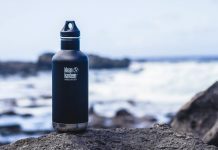 Buy one today at rei.com for $34.50. Coleman had the perfect camping fridge for a long camping trip. This large camping fridge has a capacity of 50 quarts and it can hold 72 cans besides the ice. 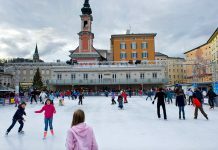 The ice will stay put for 6 days even in blistering temperatures of 90 degrees. It has wheels and an extra long pull handle to help transport it easily, making it easy on the back especially when loaded. The design is practical with four cup holders on the lid and has a fuss free no tilt drain. Portable and easy to handle it is the perfect choice. Sized at 31×15 1/2×17 it is compact too. Available at amazon.com for $73.99. 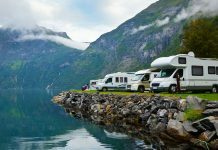 Koolatron Voyager is the right choice from camping coolers offer if your family is traveling on the road. Designed for rugged handling it has a large storing space and will keep your food cool for as long as you wish. It saves a lot of time on a road trip as it eliminates the need to stop at convenience stores to pick up food or beverages. It has a 12 volt plug that can be easily plugged into the cigarette lighter. 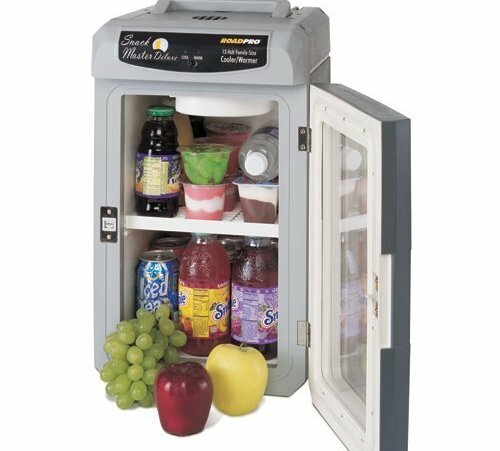 It keeps your food and drink chilled, and maintains temperatures 40 degrees F below ambient temperature. You can also use the Koolatron Voyager to keep food warm. It comes with an AC adapter which lets you use it at home if desired. All you need to do is plug it into a 110Volt standard household outlet. 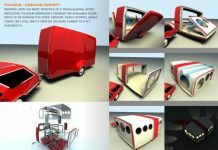 You can use it as a camping fridge for it is perfect for the task. Available from $112, check out shopping.lycos.com for further information. 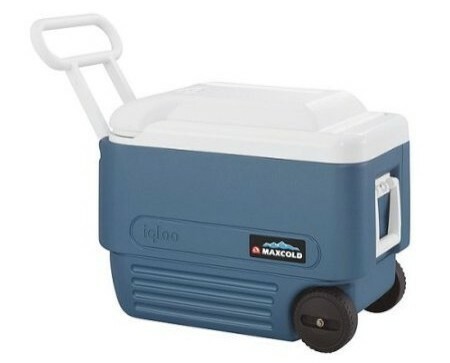 The Igloo Max Cold is the perfect camping fridge for the beach, camping, hunting, tail gaiting or for just lounging near the pool. With a capacity of 40 qt, this wheeled cooler has easy to grip handles that swing up for ease tow facility. It can easily hold ice along with 56 cans, and you can be assured of well cooled drinks even after 5 days as the ice does not melt easily, thanks to the insulated lid. This easy to clean camping fridge is odor and stain resistant. Available in an attractive white blue combination, it can be your family’s companion for a maximum of $26.99. 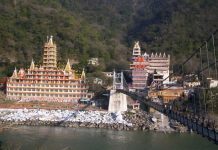 For details and other offers visit shopping.com. 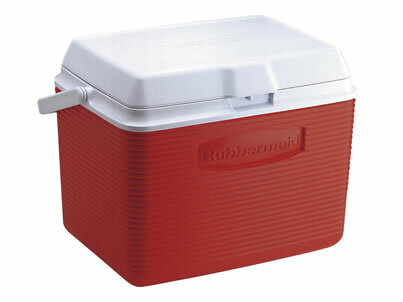 Rubbermaid 24 quart camping coolers are the perfect day partners for a picnic or a game. Attractive, with a sporty look in modern red and white combination it can hold around 30 cans along with ice. It has an easy to open hinged lid. 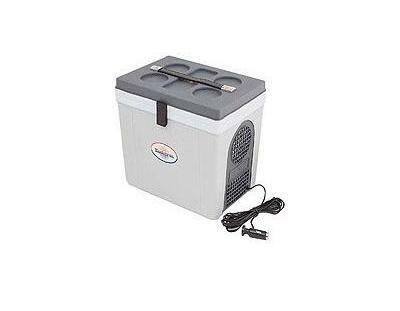 The cooler has extra insulation and the liner is odor and stain resistant. It is light at 5.9 pounds and measures 12.6” x 17.1” x 12.8”. It is yours for $21.99, go grab it at amazon.com. 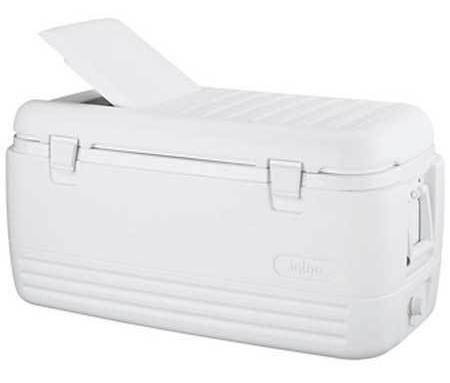 If camping trips and frequent cook outs are a part of your lifestyle, then the Igloo 44363 Ice Chest is the best bet. 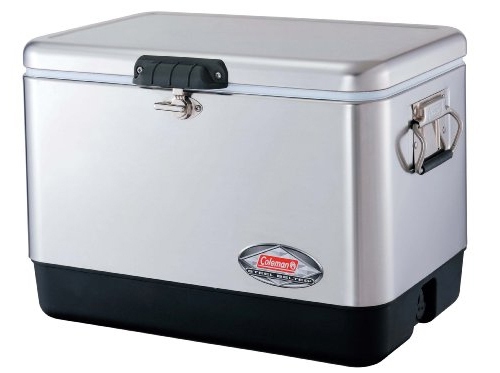 This camping fridge has ice retention of over 5 days and will keep your perishables and beverages in excellent cooled condition on fishing or hunting trips. One of the best features is the heavy duty handles that swing up for easy carriage. It has an extraordinary capacity of 248 cans and has a convenient threaded drain-plug. It measures 41-5/8 x 18-11/16 x 20-1/4 and has an easily accessed hatch. 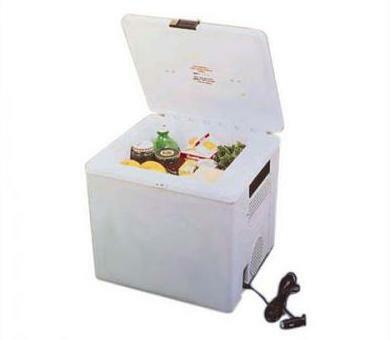 The Ice Chest is a perfect partner for those who love the outdoors. It can be yours for $89.99. Check it out at sporting-goods.pricegrabber.com. P-9 Traveleler II, is a handy traveling cooler for the single traveler. It is one of the small and compact camping coolers able to keep your food and drinks cool. Easy to carry and easy to plug into the cigarette lighter, it is able to keep your food almost 40degrees F lesser than the ambivalent temperature. 12V AC Adaptor lets you use it at home too. You may use it when you want to spend a few hours on the patio without having to get up for your favorite drink. It can also be used to keep your favorite snacks warm (though not simultaneously). Priced at $95.20. Look for deals at shopper.cnet.com. Extra large to accommodate all that you need as a family or on long road trips, this family size camping fridge from RoadPro has also a warm up function. It is easily plugged into the cigarette lighter while on the road which makes it a very handy device. Conveniently designed to be used horizontally like an ice chest or vertically like a refrigerator, this camping fridge has a thermal pane window which lets you look at its contents without having to open the door. Adjustable shelves can be manipulated to accommodate bigger items. The perfect companion for those out on camping or tailgating for long periods, it brings you the home comfort, even when you are outdoors. Visit amazon.com to pick this piece for $ 91.36.